Surface stains from things like coffee, tea, tobacco and red wine can be lightened with routine brushing, flossing and professional cleaning in the dental office. But deeper stains that come with age and damage to the tooth require bleaching agents or veneers. Walk down the aisle of your local pharmacy or grocery store and you'll be bombarded by a dizzying array of bleaching products, from gels and strips to paint-on bleach. Cosmetic tooth bleaching is a $3.2 billion global industry, according to market analysts, and it's getting bigger fast. It's easy to see why. Strikingly white, bright smiles dominate TV and social media, and people tend to prefer the bright teeth of youth rather than those that have been yellowed by trauma or age. But if you decide that you, too, want a brighter smile, it's hard to know where to start. "I'm a dentist, but I'm also a consumer and I can certainly get confused by all the products," says Ruchi Sahota who practices in Fremont, Calif. A colleague of hers describes the tooth product aisle in stores as the "dental aisle of confusion," because there are so many options. "You can easily get bewildered standing there trying to figure out which option is the best," she says. The dilemma isn't helped by regulators. Tooth whitening products don't need approval from the Food and Drug Administration before hitting the market, because the agency considers them "cosmetic," a designation that's much more lightly regulated than drugs. And, the FDA says it has not determined that any ingredients contained in currently marketed products are unsafe. The American Dental Association does offer some guidance in choosing a bleaching product — its ADA seal of acceptance. "The seal is rooted in science," says chemist Jamie Spomer, director of the ADA's seal of acceptance program; she notes that when a manufacturer applies for the seal, an independent panel of dentists analyzes the company's data and sometimes performs studies of their own. The seal is a "symbol that an independent panel reviewed and approved the product for its safety and effectiveness," Spomer says. Many toothpastes carry the ADA seal. So far only one over-the-counter-bleaching product does — Crest 3D White Glamorous White Whitestrips. Even so, Sahota says many over-the-counter products that don't carry the seal can still be effective if used as directed. Most cause some tooth sensitivity during the bleaching process, but that goes away once the process is complete, she says. Depending on which product is used, bleaching can take anywhere from two to six weeks. And, if you're not careful, Sahota says the products can leak onto the gums, causing inflammation and "extra sensitivity" to pressure, temperature and touch. A safer but more costly option might be to buy a custom-made tray from your dentist, Sahota says. Unlike the one-size-fits-all trays sold over the counter, a dentist makes the tray "just for you" she says. The tray hugs the teeth and ensures the gel is kept where it should be and is evenly applied. The kits cost about $400; this at-home whitening process can take up to four weeks, depending on how stained the teeth are to begin with. Generally, the trays are worn for one or two hours a day. If you want an even faster route, you'll have to pay more. Bleaching in the dental office can run more than $1,000, but results are quick and more dramatic. Dentists use bleaching gels that rely on high concentrations of hydrogen peroxide (up to 40 percent hydrogen peroxide, compared to a 5 to 6 percent concentration in drugstore kits and a 10 to 15 percent solution in the home-kits from dentists). So the whole process in the dentist's office can take just an hour or two to complete. And because the peroxide concentrations used there are much higher, the results can be many shades lighter than with take-home kits and over-the-counter products. An important caveat: Insurance companies consider in-office teeth whitening "cosmetic" so the procedures are almost never covered. 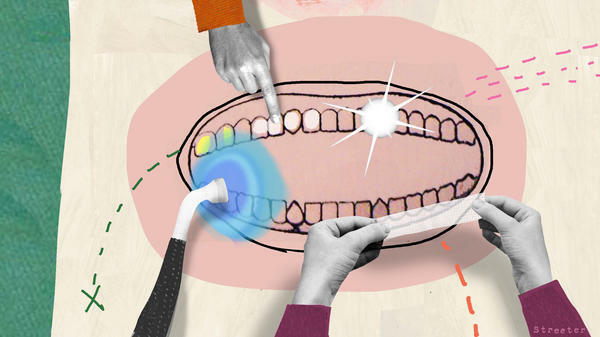 Nonetheless, more Americans are opting for in-office whitening. In 2015, in-office bleaching procedures rose 29 percent over the year before, according to an American Academy of Cosmetic Dentistry survey. And there's at least a little evidence that the whiter the smile the more attractive the person – in a 2012 study both men and women said they prefer white teeth when choosing a mate. But go to the dentist before you start bleaching, says Ada Cooper, a New York City dentist. "Tooth discoloration can be caused by cavities and other oral problems," she says. "It's more important to maintain healthy teeth." It's also important to note that not all stains are the same. Some are mostly on the surface of the teeth and come from consuming lots of dark colored liquids like coffee, tea and red wine, as well as foods with vibrant yellow spices like turmeric. The tar and nicotine from cigarettes are also huge culprits. Often surface stains can be diminished by routine brushing, flossing and biannual professional cleaning in the dentist's office. Unfortunately, there are deeper stains you just can't avoid by being careful about what you eat and drink. These come with aging and years of chewing, which causes millions of tiny cracks in the outer enamel of the tooth. These cracks can fill up with stain. On top of that, the thinning enamel can allow the yellow core of the tooth to become more visible. Grinding teeth at night and brushing too hard can also weaken and thin tooth enamel. Bleaching agents can penetrate these deeper stains and turn the tooth whiter — typically two to seven shades lighter. There are some discolorations that just can't be bleached away. Trauma to a tooth — such as a chip or break — can also permanently discolor it from the inside, and stains from ingesting the antibiotic tetracycline or large amounts of fluoride are also permanent. In these cases, the only option for whiter teeth is a crown or veneer. All types of bleaching — whether over-the-counter, take-home kits or in the dental office — are temporary, requiring touch-ups at some point. As for homespun remedies promoted online, in social media and in magazines as being "natural whitening" agents (including charcoal, baking soda or lemon juice), the ADA says there is no evidence these methods work. Right from how smells can make us more attractive, let's turn to a multibillion-dollar global industry that is devoted to making you look more attractive, teeth whitening. Just walk into any pharmacy. Go online. You'll see them - toothpastes, gels and strips and paint-on bleaches, all with big promises to give you a bright, white smile. So tell us, NPR's Patti Neighmond, do these things work? PATTI NEIGHMOND, BYLINE: Not all tooth stains are the same. Some are mostly on the surface of the teeth and come from the food and liquid we consume. Dentist Ruchi Sahota. RUCHI SAHOTA: Coffee, tea, red wine. NEIGHMOND: And foods with vibrant, yellow spices, like turmeric or tar and nicotine. Sahota says these surface stains can be reduced with routine brushing, flossing and professional cleaning in the dentist's office. But there are some deeper stains you just can't avoid that come with age and years of chewing. SAHOTA: The hard, outer shell of the tooth can start to get thinner and start to have these cracks over time. NEIGHMOND: Literally millions of micro-cracks that can fill up with stain. And the thinner enamel allows the inner core of the tooth to be more visible. SAHOTA: That inner core of the tooth is more yellow than the white enamel. NEIGHMOND: This is where bleaching agents come in. They can penetrate that core and turn the tooth whiter again, typically two to seven shades lighter. And that brings us to what some call the dental aisle of confusion. SAHOTA: Because there are so many options. And you just get confused standing there, trying to figure out which option is the best. NEIGHMOND: It's not easy. The strips, the gels, the paint-on bleaches aren't regulated by the FDA because it considers them cosmetic. The American Dental Association offers an alternative, an ADA seal of acceptance. Chemist Jamie Spomer directs the program and says, when a manufacturer applies for the seal, an independent panel of dentists analyzes the data and performs studies of their own. JAMIE SPOMER: The seal is rooted in science. When a consumer sees the ADA seal on a product, it is a symbol that an independent panel reviewed and approved that product for its safety and effectiveness. NEIGHMOND: Numerous toothpastes carry the ADA seal. But so far, only one over-the-counter bleaching product does. Even so, many of the products that don't carry the seal can be effective, Sahota says, if used as directed. Most will cause tooth sensitivity during the bleaching process and, if you're not careful, other problems as well. SAHOTA: Oftentimes, the products can leak onto the gums and cause sensitivity. It can basically bleach and blanch the gums. NEIGHMOND: A safer but more costly option is to go to the dentist's office. A custom-made, take-home tray, which hugs the teeth and ensures the gel's evenly applied, costs around $400. Or have bleach applied in the dentist's office. Gums are protected by rubber, and bleach concentrations are high enough that whitening can occur in just an hour or two. That will cost you around a thousand dollars or more. Patti Neighmond, NPR News. (SOUNDBITE OF WINDSOR AIRLIFT'S "THE CALL OF THE FOREST") Transcript provided by NPR, Copyright NPR.